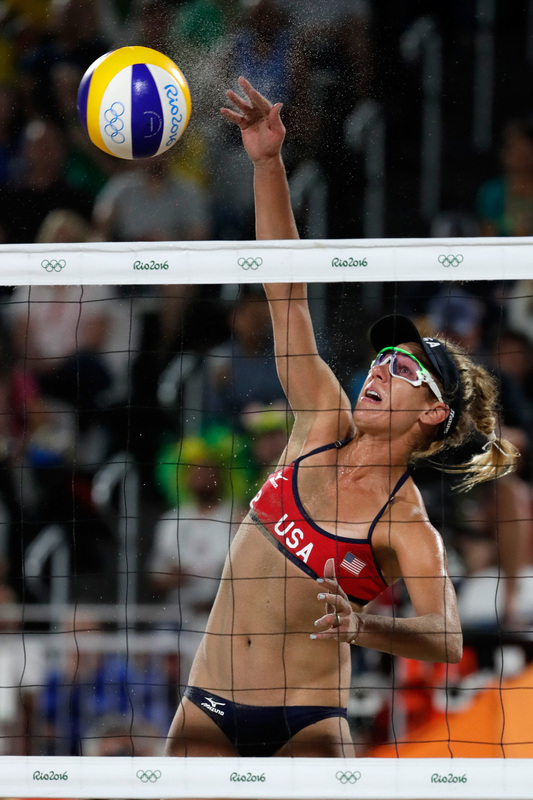 Beach volleyball players April Ross and Kerri Walsh Jennings had a gold medal on the line when they took on Brazil's Agatha Bednarczuk and Barbara Seixas in the early morning hours of Aug. 17, but their Olympic ride ended with a blistering loss. After a grueling match which at one point could have been anyone's game, the U.S. duo lost to the Brazilians with scores of 22-20 and 21-18. But despite this upset for the gold, Ross' tweet about winning the next match shows the perfect way to positively respond to defeat. The match certainly had a lot riding on it. The midnight competition was packed with a largely pro-Brazilian crowd — the Latin American country had suffered multiple defeats in volleyball and soccer throughout the day, so their hope for a victory seemed to depend almost entirely on a Brazilian win against Ross and Walsh Jennings. The American duo had yet to lose a match in Rio (for Walsh Jennings, this was her first defeat throughout her entire Olympic career). Likewise, whoever won this game would be set to play in the gold medal match. Consequently, Bednarczuk and Seixas will go on to face Germany for the gold, and Ross and Walsh Jennings will take on a different Brazilian team for the bronze. While no one would fault Ross for feeling upset by the match's result, this is an exemplary way to take one's loss in stride. Instead of focusing on the defeat, Ross has chosen to concentrate her energy on looking forward. This attitude will surely serve the American pair well during their bronze medal match against Brazil's Larissa Franca and Talita Antunes — or simply Larissa and Talita, as they're known by their ever-growing base of fans. Larissa and Talita have become powerhouses for the Brazilian volleyball team throughout the Rio Olympics, and were once favored as the most likely to hand a defeat to Ross and Walsh Jennings. So having a spirited attitude like Ross' is an absolute must moving forward in their match against this Brazilian pair. With Ross ready to bounce back, the world of beach volleyball will surely have an exciting match on their hands.